If you haven't had the chance (or the bank) to dine at Adour, the new restaurant from Alain Ducasse at the St. Regis, check out the new cookbook "Ducasse Made Simple by Sophie." 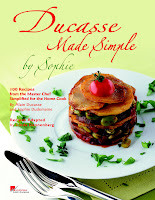 It contains 100 recipes from the master chef, simplified for the home cook by French chef Sophie Dudemaine. from "Ducasse Made Simple by Sophie"
This is a lovely, bright fall soup. Look for small (2- to 3-pound) "sugar" pumpkin that is ideal for cooking. (The large "jack-o'-lantern" pumpkins are too tough, and have lost their sugar; some have been wax-coated for longevity. Always make sure a pumpkin is suitable for cooking.) To dress this soup up in a variety of ways, Chef Ducasse suggests garnishes such as small, homemade croutons sautéed in butter or a spoonful of wild mushrooms such as chanterelles, sautéed in olive oil. You can also add a pinch of spicy ground red chili pepper to the heavy cream before whipping. In a medium stockpot, heat the olive oil over medium heat. Add the sliced onion and leek, and cook for 2 to 3 minutes, stirring frequently, until they soften and begin to look translucent. Stir in the pumpkin and a dash of salt and pepper. Add the chicken broth and bring to a boil over high heat. Reduce the heat to low and simmer for 45 minutes, stirring occasionally. Remove from the heat, add the ricotta cheese, and stir to combine. Transfer the mixture to a blender and puree until smooth. Adjust the seasoning to taste. While the soup is cooking, heat a medium skillet over high heat. Add the bacon and cook, stirring frequently, until browned and sightly crispy. Set aside. In the bowl of an electric mixer, whip the heavy cream with a pinch of salt until the mixture forms stiff peaks. Ladle the pumpkin soup into warmed bowls and garnish each serving with the diced bacon. Add a generous spoonful of whipped cream in the center of each bowl and serve immediately. Good tip about the wax on the pumpkin; I never knew that! By the way, have you ever tried adding curry to your pumpkin soup? Not sure how well it would go with the ricotta, but it pairs really well with pumpkin. Curry would be great. I keep wanting to try a pumpkin soup with coconut milk too. I'm making this one tonight, though. Susan Watterson, the co-owner of the new CulinAerie Cooking School, will be demo-ing a pumkin or winter squash soup at Bloomingdale on Sunday, btw. First and R NW.